There are times that I love the simple look of white, so I wanted to share my recent farmhouse finds. One of the nice things about having white in your home is that it is so easy to take pictures of. Just a little light a few quick touch ups with the photo editing and you're done. Well hopefully! I have wanted a farmhouse pitcher for awhile now and I didn't want to spend a lot for a vintage enamel one right now, so I found these two porcelain ones at Ross's. I think I paid around 6 dollars for each of them and I thought that was a great price. 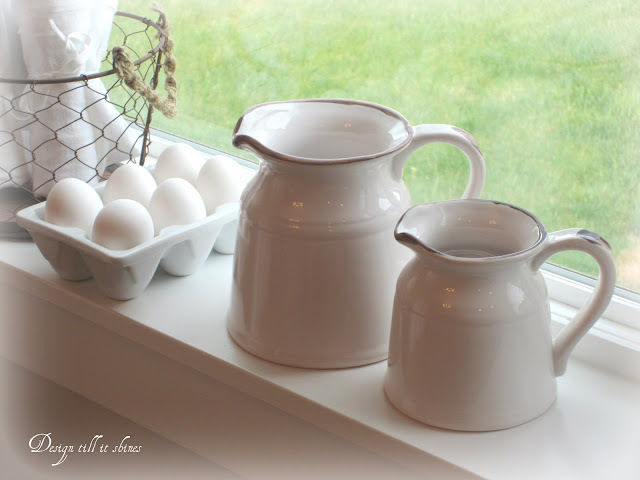 They remind me of vintage milk and cream pitchers and would look lovely on a farmhouse table. I also found this egg container. I saw one of these on another bloggers website and when I found it in white, I had to have it. I already had the chicken wire basket and I just added some white tea towels and set it on my kitchen counter. I also enjoy creating vignettes on the windowsill because of all the light and interesting shadows. 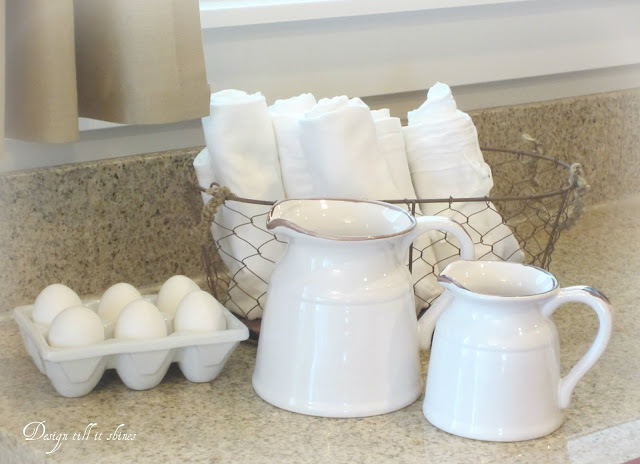 I love the shape of these little pitchers and they create a sweet farmhouse display with the egg crate. 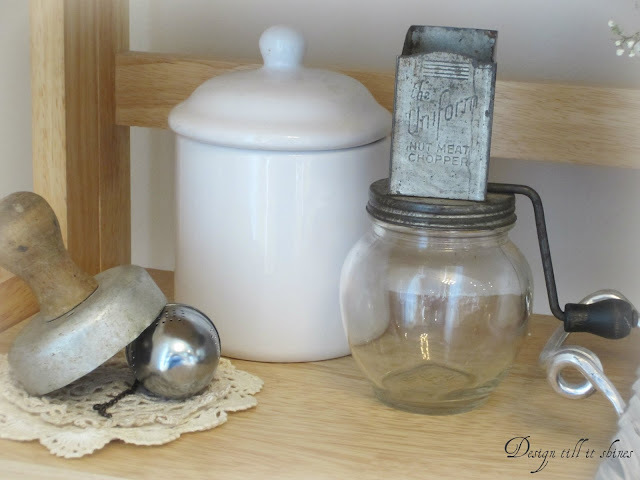 We went to an antique show earlier this year and I was looking for vintage kitchen accessories. I loved everything there, except the prices but I did manage to find a flour sifter that I really liked and some biscuit cutters. I love the green handles. I really liked the look of the nut meat chopper. I had never seen one before and thought it was a unique and inexpensive piece. I was told it still chops nuts perfectly fine, of course I'm not using it for that! I think it was made in the 1940's. I also found a white porcelain container, another biscuit cutter and tea bag leaves holder at the thrift store for a few dollars. I also love these wooden spindles. They were less than a dollar each at the antique show. They were plain when I bought them so I wrapped some cotton yarn around a few of them for interest. 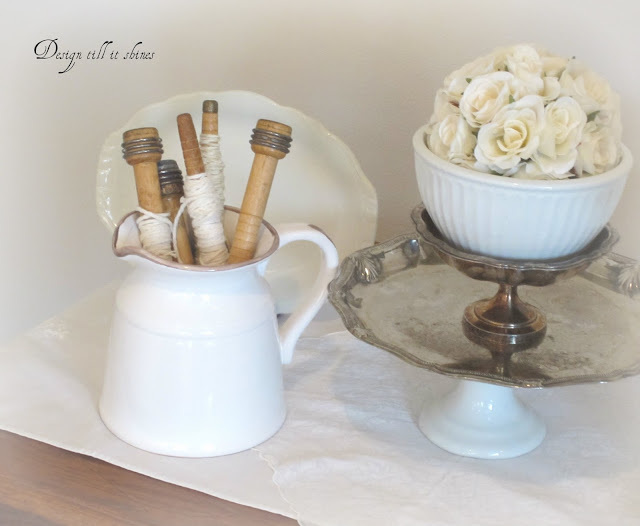 I also added some vintage white linens to this table to display my whites. I added the spindles to my larger pitcher. 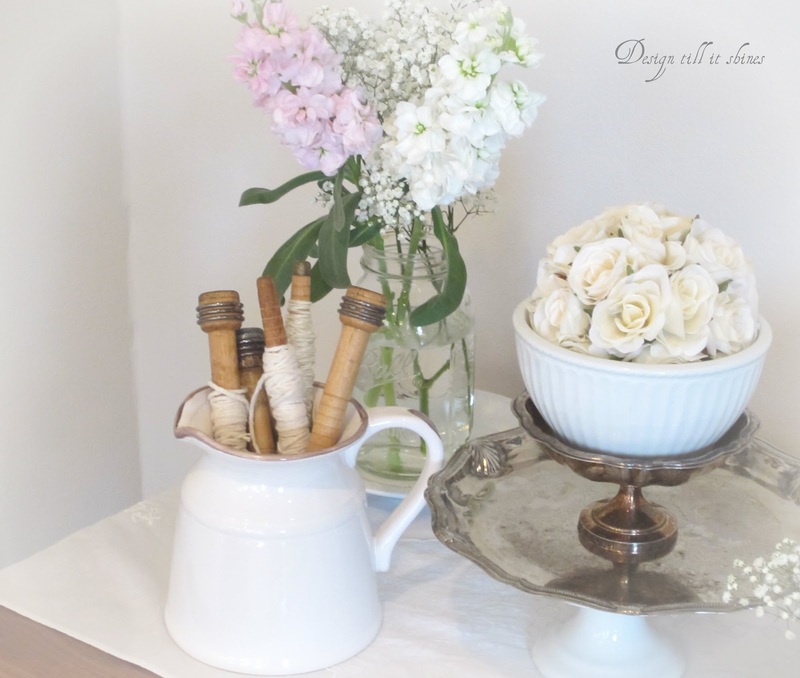 More thrift store finds and some fresh flowers for a romantic touch to the table. I also added a platter behind the pitcher for a different look. I love the warmth of wood with my white pieces. The table is a family heirloom that I always like to display. I also like my vignettes somewhat simple. I enjoy the overall feel of them more this way. 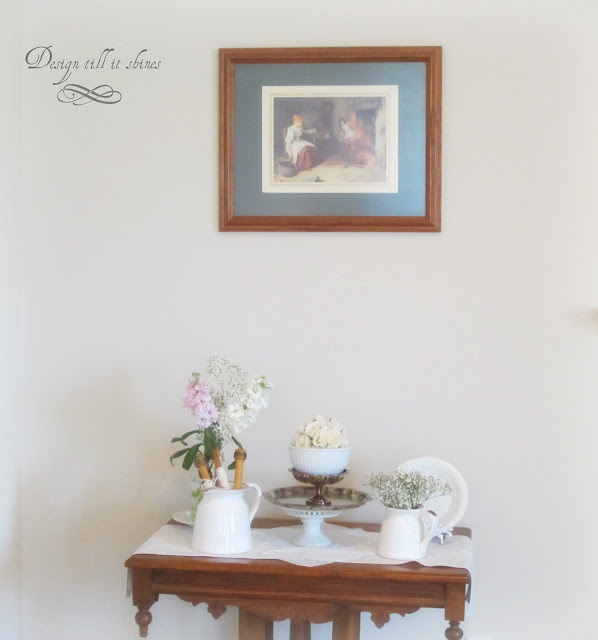 Just a simple little vignette made more lovely with fresh cut flowers. 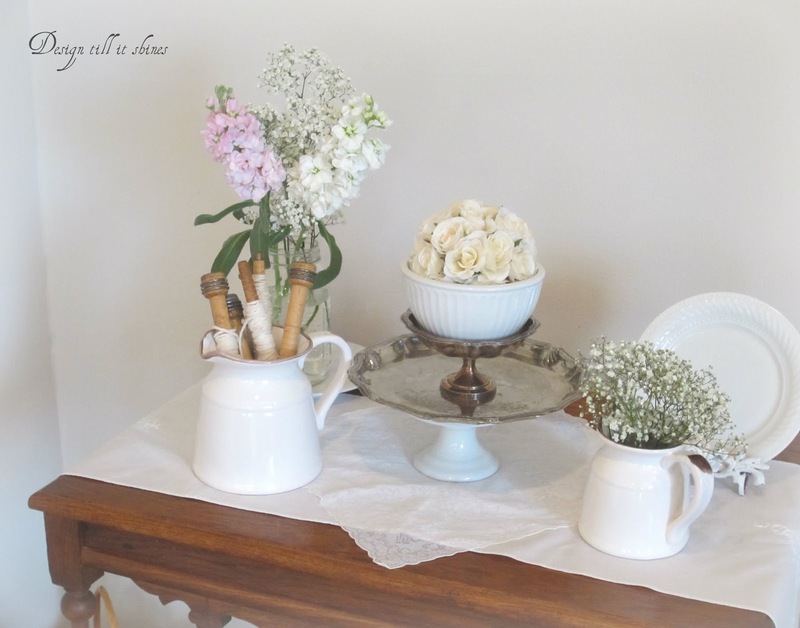 I'm sharing with Country Farm Home & Old time Farmhouse for Country whites weekend. Thanks for stopping by! Your finds and how you displayed them look beautiful! Really like that egg crate. I am such a fan of white--it makes me happy! Lots of great farmhouse white finds!! Very sweet vignettes. Hi Diane, I just love all your wonderful whites and vignettes. You sure have an eye to pulling the look all together. Love the window sill displays and your table is perfect. Loving your farmhouse whites!! 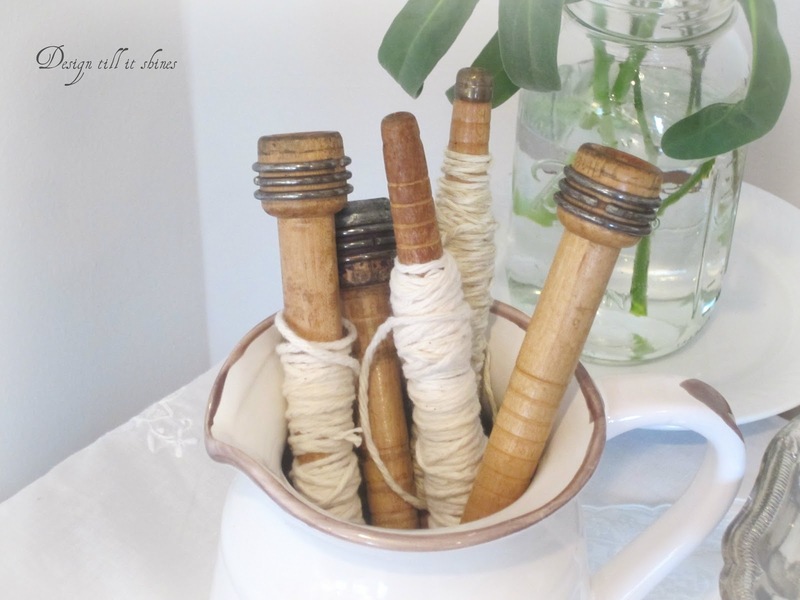 We have some things in common...I collection white pitchers and wood spindles too. I also have a stack of the platters, expect mine is silver on the bottom and the plate is white...but my little one is all silver too. Mine sits stacked up on my kitchen counter. Love your finds! Yes those vintage kitchen items can get pricey! I look for the bargains too! Enjoyed my visit! 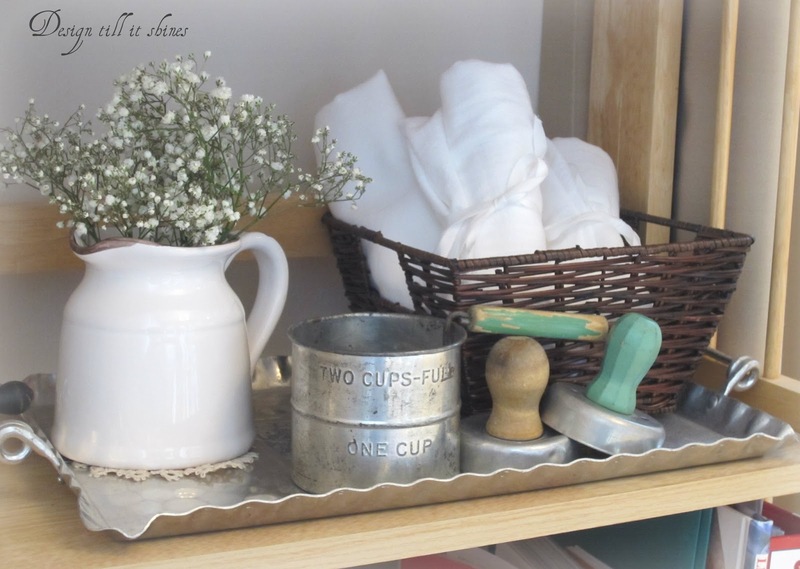 Diane, you put together several great vignettes with your whites and vintage spools and utensils. Loved them. You have found some lovely things! The pitchers are beautiful and I love the wooden spindles. Lovely post - fresh, elegant and farmhouse. Love the vignettes. Love your style, Diane! So charming! Thanks so much for sharing at Country Whites Weekend! You helped make it a great party! Hope to see you again next month! What a lovely vignette! Love your style! The pitchers and spindles are quite wonderful. So pretty. Love it all. I love the vintage farmhouse look and you do a wonderful job displaying your collections. Thanks for sharing. 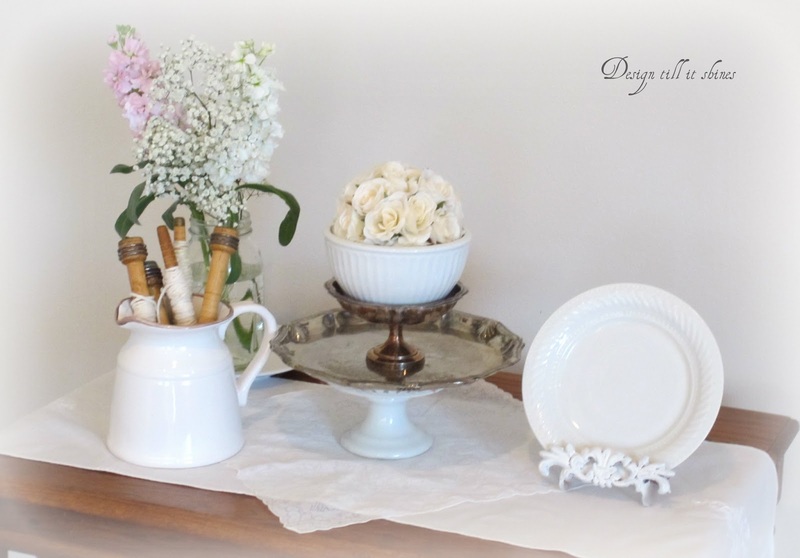 Thank you kindly for embracing your country whites and sharing your sweet vignette at Country Whites Weekend. You have such farmhouse flair! Your little white pitchers were a great find, and I like the way you styled them around your house. I am now following on both GCF and floglovin' and invite you to visit my blog. Beautiful style! I love your whites and your farmhouse touches! What a lovely post! These beautiful farmhouse white are very refreshing. Thanks for sharing. 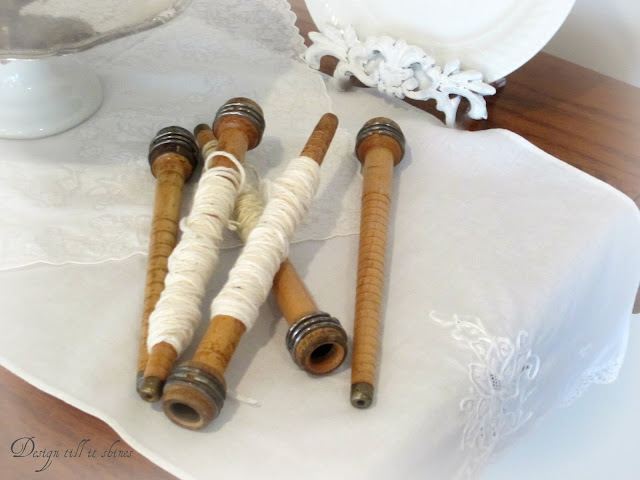 The spindles are so pretty! Just lovely. My gramma had many of those things, unfortunately we had to sell much of it when she went into a nursing home. I've kept some that were very special, though. Lovely staging :) Visiting from Common Ground. What lovely finds! I've always wanted spindles like that, but I've never found them around here for such a great price! Beautiful photos. I love whites and I love your vignettes. They all look so lovely. These little pitchers have a darling shape! Your white vignettes are charming. I love the little pitchers and the egg crate! Sweet! Thanks for joining Diann and I at TTF! Hi Diane, Nothing fresher looking than whites. Love how you have displayed them, especially on the window sill. Thanks for visiting Timeless Treasures. Hope you will visit again. Diane, I am drooling over your farmhouse finds my friend! Love, your new pitchers! I am going for a farmhouse look in my basement kitchen. I have some open shelves and want to keep them mostly white and cream. I think it could get very busy other wise. I have a few white teapots that I got a Ross a while ago. I think they were $6 or $8 ea. also. Would love to find some like yours. Your entire vignette is just lovely. You have a knack! thanks for sharing with SYC. Great finds and lovely vignettes. So pretty. I'm so glad you joined us this week at Transformed Tuesday. Have a great week. Congrats! 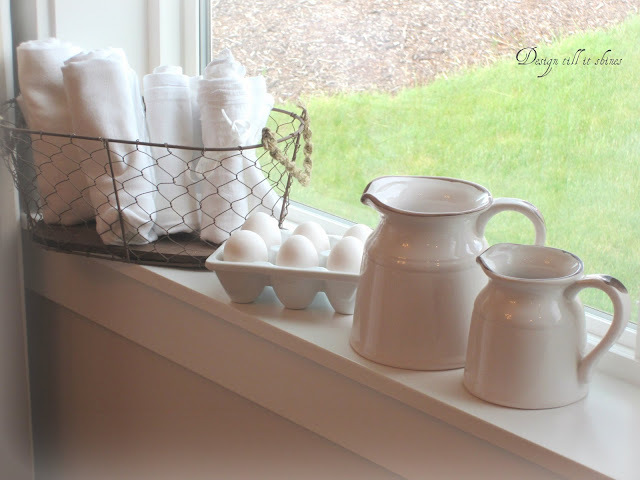 You'll be featured this week at Simple & Sweet Fridays for your Farmhouse Whites Post. Don't forget to grab a button if you'd like. Have a wonderful weekend! Hi Diane love all your wonderful "whites"! loved the groupings and I have a nut grinder like yours and do use it just fine! Thanks for linking up at Shabbilicious Friday Dianne. I'm a big lover all things white and I love all your pieces.